Deptford Foundry Studios - coming soon! Our project with Second Floor Studios & Arts is coming along nicely, with 80 artists studios set to open in Deptford within the next two months. Beep Studio is showing a quintet of paper sculptures at the Half Moon Gallery as part of the exhibition 'Havelock Walks East'. The exhibition showcases work by the wide variety of artists whose studios line Havelock Walk including Supermundane, Liz Atkin, and Lenka Rayn H.
Join us for the FREE opening event on Tuesday 19 January, 5.30 - 7.30 pm! More information on the exhibition here. 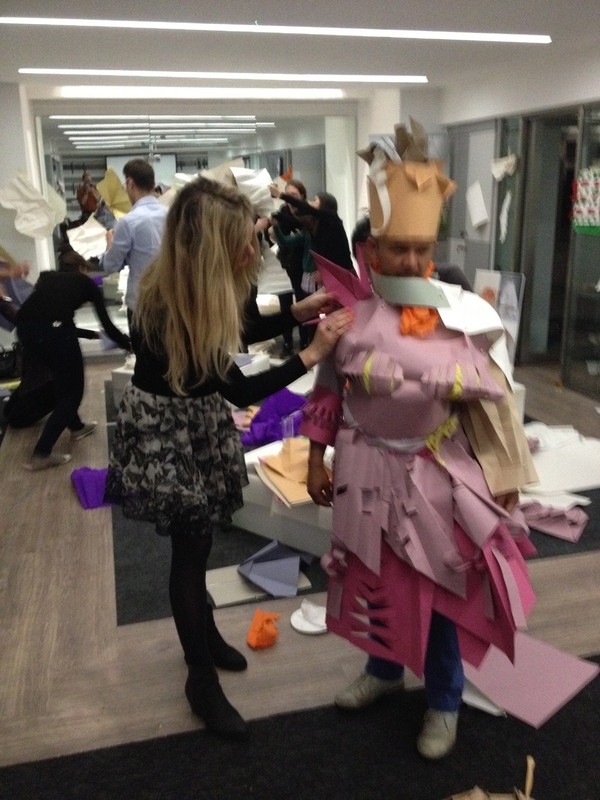 The creative juices flowed at last night's paper folding event for Desso UK! 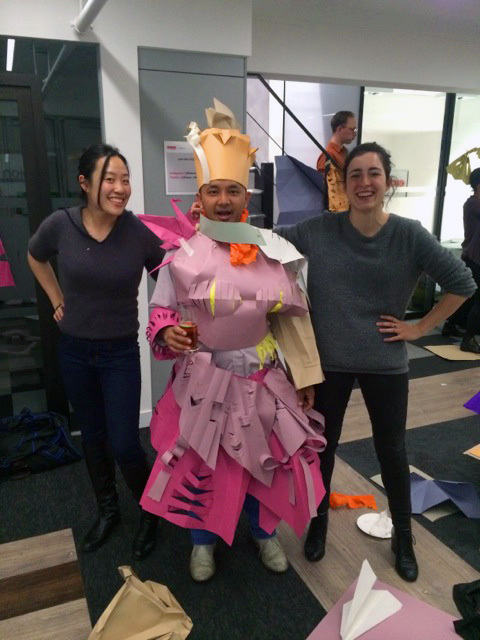 Peter from Beep Studio coached attendees on a variety of paper folding techniques, which were developed into 'papier couture' with advice from Jennifer Rodriguez-Selden. Meanwhile, Trevor Flynn of Drawing at Work led a series of life drawing exercises. In September 2015, engineers, artists, economists, designers, philosophers, scientists, industry leaders, and policymakers from across the globe will gather in Beijing to attend the Global Grand Challenges Summit. The Summit, organised by the national engineering academies of the UK, US and China, focuses on 14 'global grand challenges' that face humanity. As part of the summit, 60 engineering students from around the world get together to develop their own solutions to some of these challenges - and present them to the wider conference. Education design practice Think Up designed a one-day session in order to prepare the UK student delegation for their trip, and invited Peter and Ed of Beep Studio to help facilitate at the event. Together with Ben Godber of Godber & Co, they worked with the students to explore techniques for ideation and concept development. Working in teams, students were encouraged to voice their thoughts, challenge their preconceptions, embrace sideways thinking, explore their subjects, develop ideas, and catalogue information. At the end of the day, each team presented their thoughts back to the group. The event was commissioned by the Royal Academy of Engineering and took place at their headquarters on Carlton House Terrace. Further stimulus was provided by views of the Mall - where VE Day celebrations were taking place - and of the Palace of Westminster - as general election results were coming in. Prime Ministers were spotted! Peter and Ed were hugely impressed by the sparkiness and confidence of the students, would like to thank Oliver Broadbent of Think Up for inviting them along. Sculpture, Music & Food at Open Studios! The first weekend of 2015's Havelock Walk Open Studios was a huge success, with blazing sun, sizzling barbecue, and tinkling music. If you missed out, join us on Saturday the 16th of May for round 2! Beep took the occasion to launch a new series of paper sculptures. These are now available to view - and to buy - in our shop. Beep were also delighted to support the event by organising live music from 'OdO'.